“Whatever doesn’t kill you makes you stronger,” goes the phrase. And somehow, we all actually believe it. We humblebrag that we’re stressed about work, our families, our finances, and how hard and time-consuming it is to plow through everything on our vast and daily to-do lists. We’re super stressed about politics, natural disasters, climate change — even who will win the Super Bowl. Stress may be an unavoidable part of life, but when you get stressed and stay stressed, it’s no badge of honor. Think of the last prolonged stressful situation you were in. Not something that lasted an hour or two, like a root canal at the dentist’s office, but one that lasted weeks, months, or even years: a high-intensity job with a ruthless boss, for instance, or caring for a sick parent. When you get stressed, your body releases cortisol, aka the stress hormone. In limited bursts, this isn’t a bad thing. Cortisol has the power to lower your blood pressure, manage your blood sugar, and reduce inflammation within the body. Researchers at the University of California at Berkeley even found that when lab rats were exposed to brief stressful events (“brief” being the operative word), stem cells in their brains actually bloomed into new nerve cells. As a result, the rats’ mental performance improved. But chronic stress — that is, repeated and prolonged exposure to something stressful, like the demanding job or gravely ill parent mentioned above — doesn’t offer the same perks. Over long periods of time, elevated levels of cortisol can push you further down the road toward obesity, heart disease, depression, high blood pressure, and unhealthy lifestyle behaviors. There’s proof it takes a toll on your gray matter as well. Two areas affected are the hippocampus, which plays a central role in learning and memory, and the prefrontal cortex, which regulates thoughts, emotions, and actions by “talking” to other brain regions. “Slightly lower brain volumes and memory performance of the magnitude seen in this study are associated with a higher risk of dementia 10 to 20 years later,” said Dr. Sudha Seshadri, one of the study’s authors and director of the Glenn Biggs Institute for Alzheimer’s and Neurodegenerative Diseases at UT Health San Antonio. Dr. Monica Starkman, a faculty psychiatrist at the University of Michigan Medical School, observed a similar “shrinkage” phenomenon in patients with active Cushing disease. It’s a rare condition in which too much cortisol is produced in the body. So, should these study results serve as a wake-up call that our stressful, “I’ll sleep when I die” lifestyle may not be worth the long-term costs? Yes, says Seshadri, adding this even includes herself. Yet before you stress about your brain shrinking, keep in mind that it’s unclear whether this change is permanent. When Starkman’s patients were studied a year after their treatment for Cushing disease (which usually consists of pituitary surgery), their cortisol levels had gone down and the volume of the hippocampus increased. “Their scores in learning increased as well,” Starkman said. We also know that a person’s memory performance can improve, points out Seshadri. “Reducing stress might [also] help, but the only way to be sure is through clinical trials, and these have not yet been done,” she said. For now, your best bet is to simply protect your brain from stress as best as you can. To do that, it helps to know what stress looks and feels like. We tend to most commonly associate stress with irritability or tears, but it’s not always so obvious. 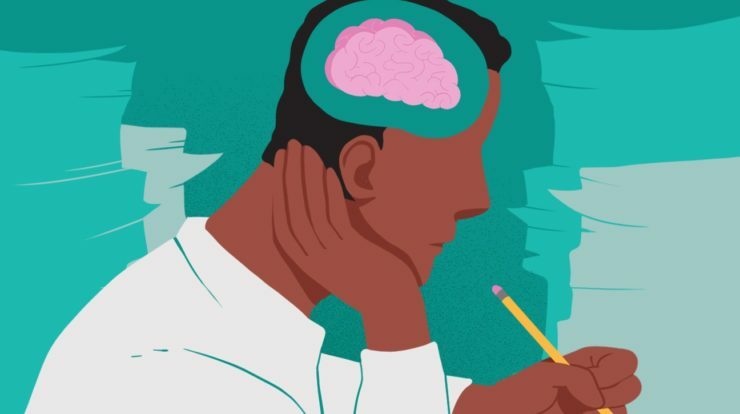 “Cognitive signs of stress can include memory loss, difficulty thinking, concentrating, and decision-making,” Nesheiwat said. Stress can manifest as physical symptoms as well. For instance, you may experience fatigue, weight loss, headaches, digestive problems, body aches, and joint pain. Recognize any signs? If so, it may help to start working your way through these tips. Even a brisk 10-minute walk can help you feel better equipped to deal with everything that lies ahead. “Exercise secretes endorphins, the hormones that improve our thinking, concentration, and mood,” Nesheiwat said. Some people find that regular workouts alleviate their anxiety as much as medication. Even better: There’s evidence that regular aerobic exercise may help maintain brain size and function as you age. “Our body heals and regenerates when we rest,” Nesheiwat said. Plus, if you don’t get enough shut-eye, your body will actually increase its output of stress hormones. Aim for seven to nine hours of sleep each night. “What we eat fuels our system,” Nesheiwat said. Opt for whole grains, fruits, and veggies, which contain complex carbs that boost production of serotonin, a neurotransmitter that helps level out your mood. Stress is sometimes due to not what’s going on around you, but internal stressors, such as depression or diabetes. “Get a thorough medical evaluation,” said Dr. Santosh Kesari, a neurologist, neuro-oncologist, neuroscientist, and chair and professor of the department of translational neurosciences and neurotherapeutics at the John Wayne Cancer Institute at Providence Saint John’s Health Center in Santa Monica, California. When you socialize and feel supported, your body produces more oxytocin. This “feel good” hormone reduces anxiety and generates a sense of calmness. It also has the power to reduce those pesky cortisol levels. Mindfulness exercises like yoga, relaxation, and meditation won’t magically make your stress evaporate, but they can help you better manage it. Or at least help you feel like you can, which, of course, is half the battle.